Authorities of the FCT Emergency Management Agency and the Nigerian Geological Survey Agency (NGSA) have on Friday, allayed the fears of Abuja residents over speculations of an imminent earthquake in the Federal Capital Territory. The development followed several reports by residents of the city about persistent earth shakings in parts of the Federal Capital Territory, over the last three days. After days of speculations about his movement to the ruling All Progressives Congress (APC), former Kano Governor and chieftain of the People’s Democratic Party (PDP), Ibrahim Shekarau has on Friday, joined the broom party which he co-founded in 2014. 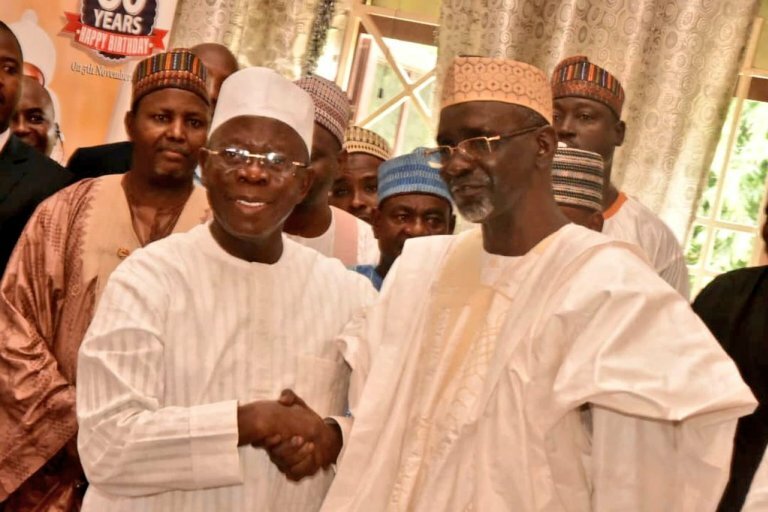 National Chairman of the APC, Comrade Adams Oshiomhole, who led a delegation of bigwigs of the party to formally meet Shekarau at his Mundubawa residence in Kano, said “We have come to reunite with a friend, Comrade and a real Progressive in order to move our party forward,” expressing optimism that his defection to the party would strengthen the party in the state and the country at large. The Presidency has handed over 19 official vehicles retrieved from former commissioners of the National Population Commission (NPopC) who allegedly made away with them after their tenures in office. Chairman of the Special Presidential Panel for the Recovery of Public Property, Okoi Obono-Obla, who perfomed the brief hand over ceremony on Friday at the office of the commission in Abuja, said the recovery of the vehicles meant for operations of the commission, followed a tip-off by a member of staff of the commission to the panel in March. Obono-Obla stressed that the event should be a warning to all other public servants, including himself, to desist from converting official property to personal use, adding that the Buhari government would not tolerate such acts. The Buhari Campaign Organisation has faulted the call by the opposition People’s Democratic Party (PDP) on the Independent National Electoral Commission (INEC) to note that the purchase of the N45 million form by a group for President Muhammadu Buhari directly violates section 91 (9) of the Electoral Act. Director, Strategic Communications of the Campaign Organisation, Festus Keyamo (SAN) disclosed this on Friday in a series of tweets, berating the PDP as mischievous persons misquoting the law which provides that “no individual or other entity shall donate more than One million naira (#1,000,000) to any candidate,” as the President was yet to become a candidate. The Nigerian National Petroleum Corporation (NNPC) has assured the public that it had adequate storage of petroleum products across the country and advised that they should not entertain any fear of petroleum shortages. A statement by the spokesman of the corporation, Ndu Ughamadu, in Abuja, on Friday read that there is no need for panic buying of petroleum products by motorists and the public, as the corporation’s management were engaging the parties involved and the parties are close to resolving the issues. The statement by the NNPC, followed reports of an ultimatum issued by the Nigeria Union of Petroleum and Natural Gas Workers (NUPENG) over a purported intervention by an arm of the military in what the union viewed as purely labour matters involving a company and its workers in Delta. Russian President Vladimir Putin has rejected Turkey’s calls for a truce to prevent a “bloodbath” in north Syria.